The Titan football team defeated Wheatland Grinnell with a score of 65 to 22 at Grainfield, KS on Thursday, October 30th. This was the final game of the 2014 season. The Titans finished the year with 6 wins and 3 losses. High school students will have a short break before the first day of basketball practice, which starts Monday, November 17th. The Winona Chamber of Commerce held their annual hot dog roast and games on Friday. October 31st at the Masonic Lodge building on main street of Winona. Thank you to the chamber for supporting the youth of the Triplains community by sponsoring the event. Parent conferences were held October 28th and 30th. 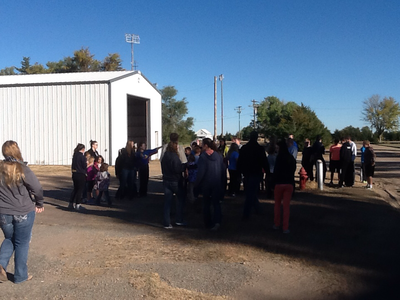 The school had a fairly large turnout, with 89% of students' parents attending. Thank you for coming out to conferences. If you didn't get a chance to come in and would like to visit please contact your student's teacher. Report cards that weren't picked up will be mailed home. The Triplains Kay club held the annual Halloween party for K - 4 students on Thursday, October 30th. Triplains students in grades 7 - 12 participated in cancer awareness activities on Thursday, October 30th by wearing pink to school, a game with prizes, and balloon launch over the noon hour. The end of the first nine weeks will be Friday, October 17th. Our fall at Triplains has flown by. School is in session on Monday, October 27th. Parent conferences are scheduled for the evening of Tuesday, October 28th and the morning of Friday, October 31st. The last regular season high school football game is Thursday, October 30th. There is no school on Friday, October 31st. The Titans defeated the Weskan Coyotes, 37 to 25, in an afternoon game at Winona on Friday, October 24th. Due to a shortage of football officials this game was held in the afternoon in order for the officials to also work an evening game in neighboring Sharon Springs. The game was a six man game, using unique six man game rules. One of the major difference in the rules is that the quarterback is not allowed to run the football, he must pass, pitch, or hand off. It was an usually warm October afternoon, with temperatures in the mid to upper 80s. The junior class provided concessions. The Triplains pep band played on the home side of the field. The flag was raised by the Winona Girl Scout Troop. At halftime the Titan cheerleaders performed a dance routine. Our high school KAY club collected donations for the veterans hospital during halftime. Thank you to all volunteers that help make our football games possible. 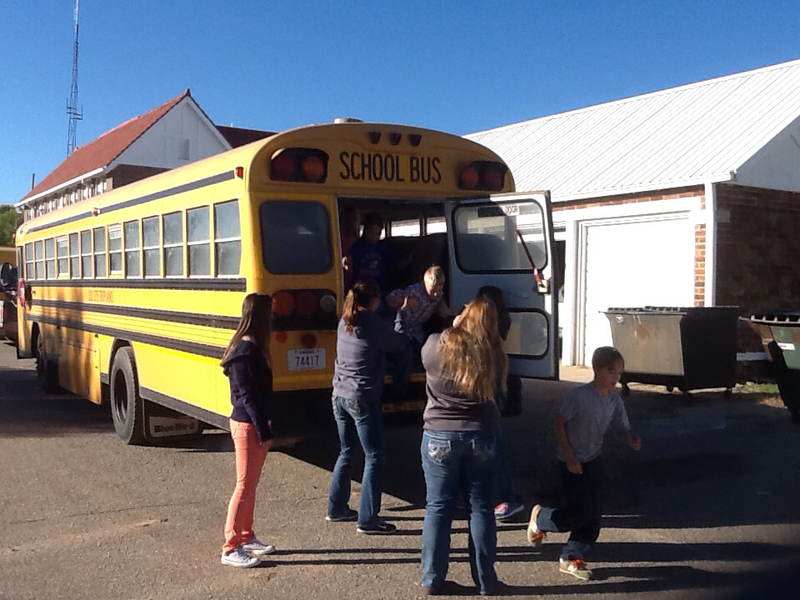 The Titans defeated Golden Plains in two sets during the first round of sub state volleyball at Almena on Saturday, October 25th. Next the Titans faced Logan in the semi finals. The Titans lost to Logan 20 - 25, 16 - 25. Logan then went on to defeat Northern Valley for the SubState Division II championship. The month of October is here at Triplains, August and September went by so quickly. Students and staff at school have been very busy during the first quarter. There have been many accomplishments by all of our K-12 students. We are proud of our students, an enjoy working with them. There have been many improvements and changes in the building and district this fall. Sarah Hyatt has joined us as the 7 – 12 English teacher. Her and her husband, Ben, are expecting a new little one the first part of November. Amy Lamb is helping Bonnie in the kitchen. We are pleased to have both Amy and Sarah on the Triplains staff. The building and grounds saw changes over the summer. The lunchroom looks great with new windows; several people have commented about the natural light it lets in. The grass on the front yard was planted in June, and has done well with the wet summer. Mr. Korte covered the gym windows on both the outside and inside, giving them an improved look. Several classrooms were moved around over summer, those teachers seem to be getting along great in their new rooms. The lights in most of the classrooms were updated this summer, which should help with the electric bill. The shop class is finishing up work on the track shed. Harper of Winona put in our new drop ceiling last summer in the 1960 portion of the building. Later this month, American Boiler of Salina, will be installing two new high efficiency hot water boilers to replace the 1960 boiler located in the basement of the gym. Earlier this fall the Triplains district was announced as the winner of a $10,000 grant from the Monsanto company. Across the state there were 5 grants of $10,000 and 2 grants of $25,000. We will be using the grant to purchase a greenhouse. The grant was written by Kate Moorhous, 7th / 8th grade and title I teacher. Monsanto presented the district with a check during halftime of the homecoming game. New students this year in the elementary school are the kindergarten class of Carson Bergsten, Tristen Chase, Jamie Hemken, and Padon Mackley. New students in high school are JD Draper, Shannon Drury, Ana Gligorijevic, Alvaro Ramos, and Wakana Soejima. We are off to a great start at school. This past week the high school students participated in homecoming activities. The theme was, “Drops of Jupiter.” Students and sponsors had a great week and showed that school spirit at Triplains is alive and well, with great participation by the entire student body. The enrollment numbers at Triplains, like all small schools in the area, continues to affect the amount of budget authority the district has. Our overall enrollment this year is down 10 students from last September. 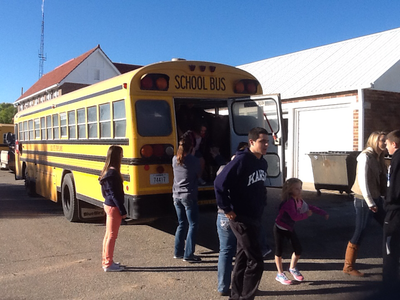 We would like to thank our parents and community members for supporting the Triplains district. Our district consists of 660 square miles in Logan, Thomas, and Wallace counties. Our school continues to offer students great opportunities. We have started a new school website. The address is www.triplains.weebly.com be sure to check it out. 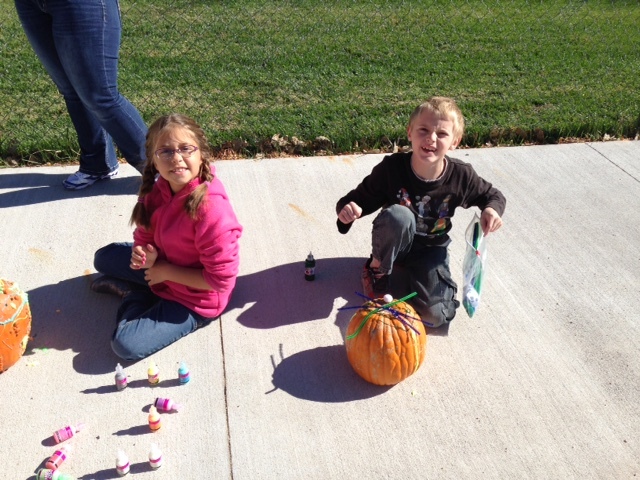 K-6 students and teachers decorated pumpkins on Tuesday, October 28th. Pumpkins will be on display during Tuesday night conferences. 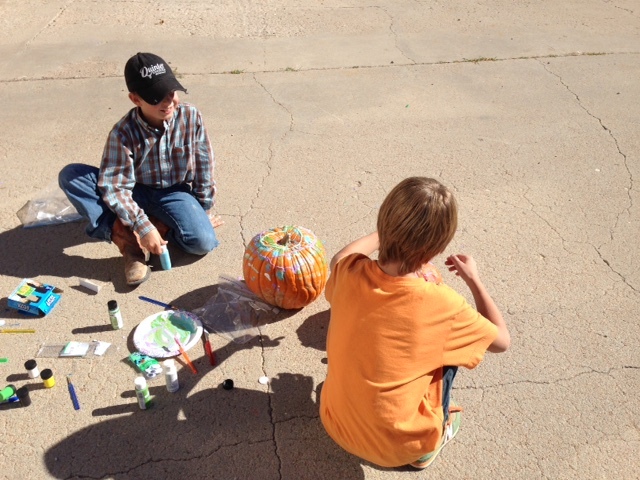 The pumpkin decorating has become an annual event at Triplains.